So you’ve booked up for some days in the sunshine. You’re planning to relax on the beach, soak up the rays and quite possibly, do very little else! 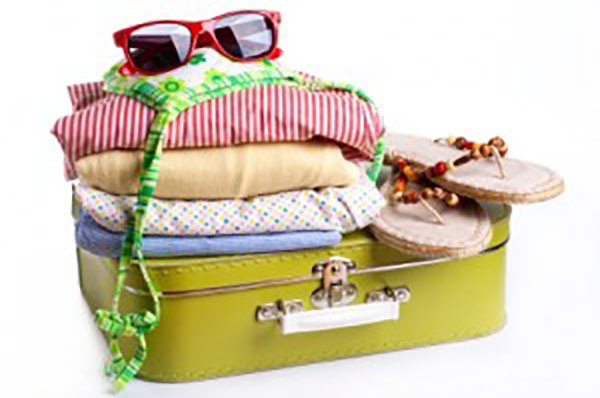 It might seem like you don’t need much in your suitcase apart from half a dozen swimsuits, but take a look through these handy tips to make sure you’ve packed everything you might need. First of all, make sure you do the minimum of research required: check the weather forecast! Yes, so you have booked a trip to your dream beach location, but that doesn’t necessarily mean that you’ll be in for a week or two of blissful sunshine and scorching heat. If you’re heading to a tropical location such as Asia or Central America, then bear in mind that at certain times of year there are likely to be downpours and storms. Perhaps they’ll only last for an hour each day, but you’ll probably be in need of an umbrella, waterproof jacket and some layers of warmer clothes for when the Sun disappears behind the clouds. Check if your hotel provides umbrellas, I recently stayed in Fiji and there was a lovely big umbrella in my Bure for those days that it rained. In other destinations such as Europe, it gets a lot chillier in the evenings. So be sure to check the local recommendations and pack accordingly. You’re going on holiday, not to a fashion show. I have numerous female (and male!) friends who fill up half their suitcase with beachwear. Needless to say, out of the fifteen bikinis they’ve carried in their luggage, only a few ever see the light of day when they get to their destination. Why? Simply because they haven’t thought it through. When I’m packing, I pull out all of the swimsuits in my closet and I try them all on. This first stage reminds you of how you actually look in your swimwear and if there’s one of two that you don’t feel comfortable in or don’t fit you as well as you would like, then do not pack them – simple! I then try to choose no more than two or three to take with me. You can sometimes work this our around what your plans are for the holiday. If you’re going to be playing sports in the sunshine, then pack one with a sturdy top, and if you’re going to be focussing on your tan, take one that’s strapless. Remember that bikini tops can also be worn under clothing, so also have a think about whether the ones you want to take will go with your tops and dresses. Some things are just good to have in your luggage, no matter who you are or what kind of beach holiday you’re going on. A sarong is one. Not only can it be used as a beach cover-up, it can also double as a dress or skirt, a headscarf, beach towel, sun shade and even as a changing curtain. On my beach vacation I spent a lot of time in a bathing suit and sarong. Also take a bag that will double as a beach bag and as your carry-on luggage at the airport. Check in advance whether your hotel provides beach towels, hair driers, irons and so on in order that you don’t take anything you don’t need. You will probably spend most of your time barefoot, but take along some sandals, a good pair of walking shoes in case you go hiking up the side of an island, and some jandals (flip flops, thongs). I actually spent a good part of my trip to Fiji, bare footed. It was so much easier walking along the sandy beaches without having to keep pulling my sandals out of the sand. Your lifestyle will be different for the short time that you’re away, so you may not need a lot of the things that you use in your day to day life. As I have dry skin, for example, I use a creamy cleanser and a heavy moisturiser. But when I go on a beach holiday, I rub thick sun lotion into my skin everyday and using my normal products would just make me break out in spots! I buy a sample size of exfoliating cleanser to get out the lotion and don’t bother with a facial moisturiser. My lips dry out a lot more in hot weather, so I always pack a good lip balm. Coconut oil is also a good substitute for your usual moisturiser. It might also be worth buying some waterproof make-up to replace your standard stuff. Not only will it stay put when you’re splashing around in the sea, but your everyday make-up won’t be ruined by the high temperatures and humidity. I don’t wear makeup so this isn’t an issue for me, but a number of my friends won’t go anywhere without their makeup on. Some things just aren’t worth packing in your suitcase. For one thing, forget sun lotion and mosquito repellent. As long as you buy a decent brand of lotion in a high enough factor, then it will protect your skin. Purchasing this in your destination may well be cheaper, and it will reduce the weight of your luggage en-route. Mosquito repellent purchased in the local area tends to be more effective than one brought in from another region. Research in advance what the place you’re visiting offers in terms of shopping opportunities. It might be a great place to pick up good value clothing and fabrics, or the airports you’re passing through might have large duty-free malls. With a little bit of planning, you can travel lighter and pick up some useful souvenirs along the way. If you’re travelling with kids, that adds a lot to the otherwise simple packing check list. There are some simple items that you can include though, that will take up very little space and keep the kids happy. For example, an inflatable beach ball doesn’t need much room, and neither does a pack of sandwich bags. Your children can use these to gather shells on the beach and can also be used to put wet clothes into at the end of a day at the beach. Sign up for our travel newsletter for sporadic emails but valuable content, hints and tips. I love to travel, and I travel most often with my friend and business partner Paula. We have lots of experience making travel arrangements, organising hotels, flights, restaurants and sight seeing. Women who travel have a whole range of things to consider, especially those brave souls who travel solo. Travel Tripz - is here to give you the knowledge you need to have an enjoyable, safe experience. So go forth and create those lifelong memories, knowing you are forearmed with all the information you need.